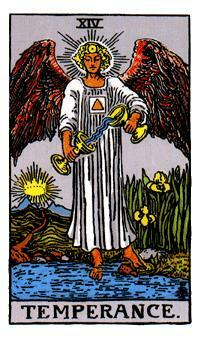 When the Temperance Tarot Card appears in your reading it often symbolizes a strong self-control. It also signifies your ability to handle volatile factors and in turn, being able to bring out a positive result. This tarot card delivers a message of a time of harmonious relationships. Qualities such as peace and harmony. A reminder that life is a time to be enjoyed. A stark reminder that moderation in life is the key. This applies to everything. Additionally, spirituality will bring comfort. It is often said by experienced readers that this card usually represents a guardian angel looking over you. A nice thought indeed! Negatively however, The Temperance Tarot Card represents over indulgence. More concerning is that it can deliver a message of a lack of foresight and impatience. You will also need to be mindful of conflicts and arguments that can potentially cause domestic problems. This tarot card is a great warning to not make hasty decisions due to your impatience. This can obviously harm any positive and productive progress.